Fairlee VT real estate provides commuters with easy access to Interstate 91 and the Hanover-Lebanon area. The small village located on the banks of the Connecticut River and is known for the many summer camps and vacation homes on its beautiful lakes Morey and Fairlee. 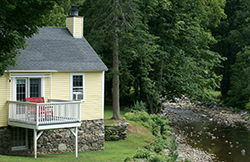 Scroll down to find all current Upper Valley real estate for sale in Fairlee, VT including single family homes, multi family homes, and land. Contact us if you have questions or would like to learn more about a listing. To learn more about Fairlee, click here! Here is an excellent opportunity to get that rural, secluded part of Vermont. Enjoy the hunting, the fishing (in the brook that runs through the property), and the trail systems all available from this "surveyed" 39.6 acre parcel situated off a Class 4 road. You can access this property in the summer with 4x4. In the winter you may have to snowmobile in on the Vast Trail that goes right by the property. This is a great location to build your camp or home and live off the grid. Note: You can enjoy the seclusion and yet you are only 20 minutes to I-91.